The Business Model Canvas is now perhaps the most widely used tool to help entrepreneurs and managers both in the commercial and nonprofit world—to describe, design, challenge, and pivot business models (the way in which revenue will be produced). It was invented by Alex Osterwalder and a team of many others and first published in 2008. Since that time many variants for specific applications have been developed. This is the essential business model canvas. I suggest that you work on in a team, even if you start off solo. It will be richer and more useful to have it develop from discussion. I suggest you start your work on the value proposition and as you begin to consider the other boxes you will begin to understand the interplay between each—and see some ways that the business model may creak! Also online you will find many options for interactive versions, not least on Alex’s own website, strategysizer.com. On the other hand, I am happy to work with you, just as I have with both my MBA students and other entrepreneurs. Don’t fall into the trap of thinking that once you’ve filled in the boxes of your business model canvas, you’re done—you have only just begun and as you go through different versions as the result of deep examination and lots of work with others, you will begin to realize that to get to a one page business model is more difficult than one that fills a whole file. It’s just like writing a really good summary of a business plan. It probably takes as long as preparing the whole plan. 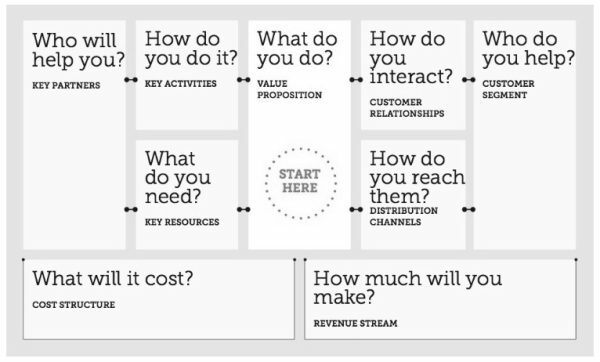 Getting to the kernel of how your business idea is going to produce sustainable income, is hard work, but the Business Model Canvas is a beautiful framework that I have seen work for people time after time. If you need help, I would be happy to hear from you. To learn more, go to Build Your Business Model on venturefounders.com.